The waitress explains that all the dishes are meant for sharing, so order a bunch and split them up. While some items on the menu like the spareribs and the awesome tater tots with sriracha ketchup are easily divisible. Other dishes like the corn pancakes or the Korean fried chicken with waffles were a bit less so. Where there's a will, however, there's a way. 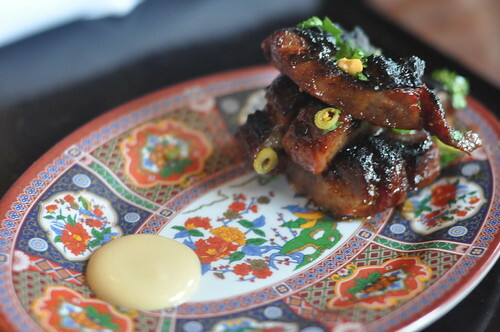 The spareribs ($10) were FANTASTIC. Such slow smoked goodness. 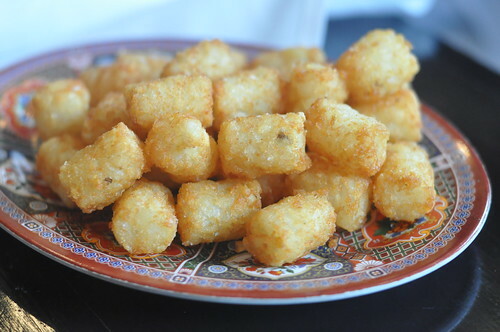 I could seriously eat an order of these myself. But there wasn't enough to make a meal there alone (and come on, I love me some pork shoulder, but seriously, 6 pork shoulder "ribs" for $10--it's pork shoulder!). The corn pancakes ($12) with Edwards Surryano h.a.m. were a better bet in terms of value. You still might be hungry after them, but not overly so. 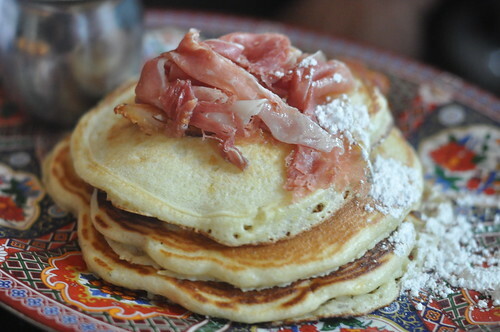 Plus sweet corn pancakes with browned butter syrup and cured ham is goooooood. 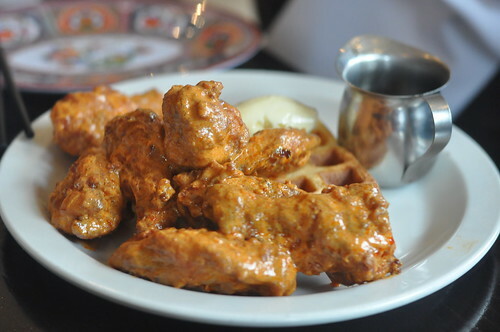 Likewise the Korean fried chicken & waffles ($14) are a good bet for those with a larger appetite. Lawman and Lawman-in-law were disappointed that the wings were more like Korean-inspired hot wings rather than that crispy crunchy friend tastiness we're used to getting in K-Town. The flavors are complex and undeniably good, but you could easily run up a serious tab on sharing plates. If you're watching your wallet, I'd suggest going in a large group so you can have just a taste without getting stuck with a big bill.